When we bought Life’s TraVails, the aft tank had been out of service for over 10 years and had some obvious “issues” along the bottom seam as viewed from the steering gear access hatch under the bed. So we decided we had 4 options: 1) do nothing and carry around the dead weight, 2) replace the tank, 3) remove the tank and replace it with a combination of additional water and storage, or 4) remove the tank and use the entire space for storage. Since we were getting ready to leave a home port behind to do the loop and had a dock box full of stuff we wanted to take, the decision was option 4 – more storage. So then the question was how to get the thing out of there? Upon examining the inside of the tank from the inspection port, I found the tank was 3/16 steel and there were 2 baffles running across the tank and one running lengthwise. After all those years, there was still about a cup of fuel in the tank, and a lot of condensation. The top of the tank was dripping wet. And the fumes were, let’s just say, not what you would want in your sleeping quarters. After corresponding with some folks on the DeFever Cruisers Forum, I decided I could get access to the tank by cutting the bottom out of the bed. There was a 2 x 2 (full 2 inches) running around the edge of the bed, as well as forming a couple of braces crosswise. It seemed that if I cut through the plywood along the top of the braces, I could create not only access to the tank, but hopefully a hatch to access the new storage area, which thankfully worked out. So out came the skill saw and I cut the thickness of the plywood out on 3 sides of the bed up to the seam where the 2 pieces of plywood came together. This gave me a 48” by 54” area to access the tank, but that left about a foot of the tank under the area I did not remove. So I thought I had the top figured out, but I still didn’t know what was under the tank. Although it did not seem logical, it looked like the tank was sitting almost right on the hull, with maybe a fraction of an inch separating them. But I decided I would worry about that when I got that far. My first attack on the tank was with a reciprocating saw (sawsall), which turned out to be slow but useful on some areas, but not practical at all for areas like the sides where the bed frame was too close to the tank. I drilled a couple of holes to get the blade in and started cutting. After about 2½ hours of cutting, and many, many saw blades, I had 1/3 of the top off and one half of one of the cross baffles out. I figured out this was more than a one-day project! We actually put the bed back together and slept there that night. Once the plywood was back in place, the smell was eliminated. The one thing that was obvious was that the reciprocating saw was not the total answer, and I would need some other cutting methods, and maybe some help. The few pieces I took out by myself were very heavy. I didn’t weigh it, but by the time it was all done, I would guess I took 1,000 pounds of steel off the boat. That seems like a lot, but it did not seem to effect the pitch of the boat, as I added about half that back in ropes and other items which had been stored forward. So several long hours of cutting the outside of the tank with a combination of the grinder and the reciprocal saw got the job done. We first took the top off the 2/3’s of the tank that was exposed, then cut down and around the sides about 6″ from the bottom. This allowed us to lift the end of the tank. We found it was actually sitting on 3 cross-braces which kept it about an 1″ off the hull. 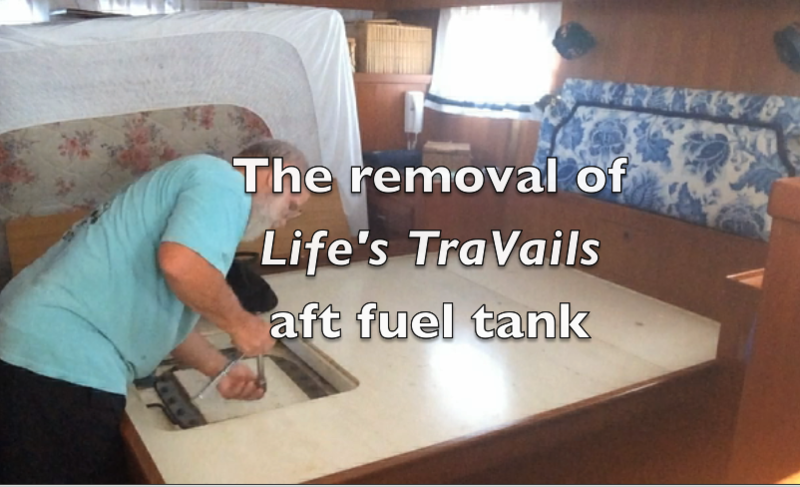 We used the grinder to cut through the bottom and took it out; then we could slide the aft 1/3 of the tank forward. Once out where we could get to it, it was soon cut into pieces and in the dumpster. Clean-up was a chore, both under the bed and the rest of the room. The aft section of the tank has actually rusted through, leaving quarter-size holes along the centerline of the tank. This resulted in an inch of rust sitting on the hull. A lot of scrapping and vacuuming took care of that mess. But the rest of the room left a bit to be desired. There was grinding dust all over everything! In retrospect, I should have covered the entire room in plastic, but there would still have been quite a mess. But on the positive side, all the walls got a new coat of polish in the process. Once the tank was out and cleaned up, I divided the area into 2 big sections. I placed a piece of half-inch plywood along the aft part of the new-found storage compartment, then another one in about the center. The dividers lined up with, and were screwed to, the cross-braces on which the tank sat. I then added some material on the bottom along the centerline to allow any water that might magically appear to flow down the hull to the bilge pump. 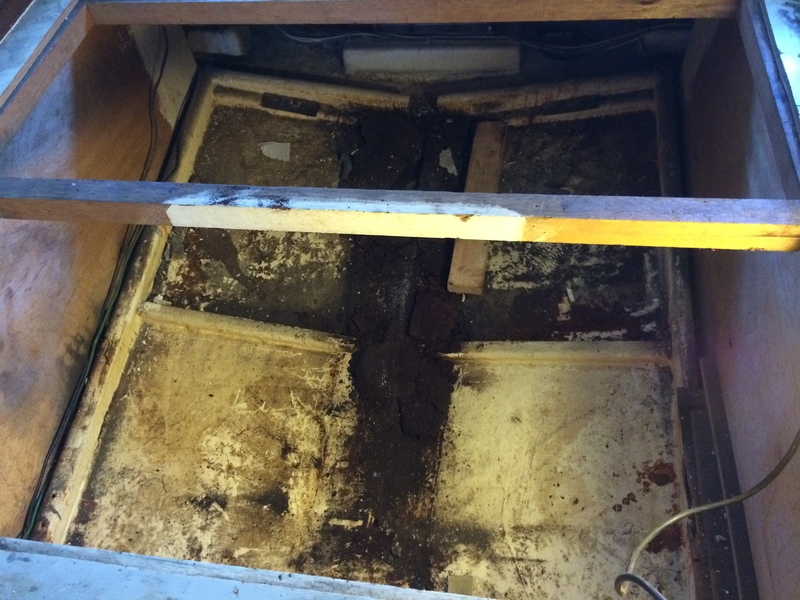 To ease access, I installed a piano hinge between the new hatch and the section of plywood that was not removed. A couple of braces made out of conduit to keeps the hatch open, and then it was just a matter of what I was going to put in this 45 cubic feet of storage I just created. 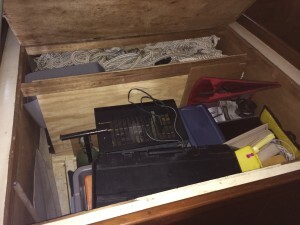 I filled the aft section with all the hurricane lines that filled the deck box, along with ones stored in all sorts of nooks and crannies around the boat. 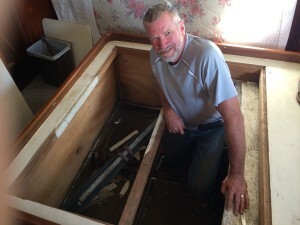 The forward section was quickly filled with many other things around the boat that were looking for a new home. The total project took about 3 days, mostly with 2 people. We reduced the cutting as much as possible by taking out pieces as big as we could handle, so you need 2 strong people. we went through about 30 sawsall blades, 50 grinder cutting disks, and a grinder. (Started off with a cheap grinder which didn’t last long, but was replaced by a better quality one which did just fine – my dad always told me to buy quality tools!) If you are really interested, the video below is a 10-minute time-lapse of the removal process (up to the point that I ran out of storage on my camera). Overall, it was a very beneficial project since it was originally a total waste of space and a half-ton of useless steel. Plus, should the need arise, I know where all my storm lines are – all in one place.